Definition: Angioplasty, also known as balloon angioplasty and percutaneous transluminal angioplasty (PTA), is the process in which a narrowing of a blood vessel is corrected. It is a minimally invasive, endovascular procedure to widen narrowed or obstructed arteries or veins, typically to treat arterial atherosclerosis. 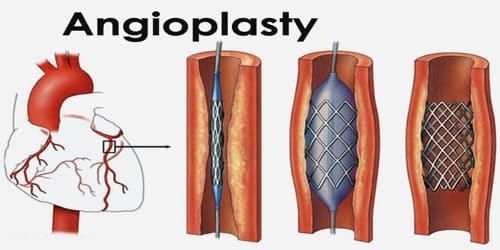 Any accessible blood vessel in the body can be treated using angioplasty, but we will follow a patient through a heart angioplasty, as it involves a little bit more care during the procedure and recovery time afterward. Angioplasty uses a balloon catheter. “Angio” means relating to a blood vessel and “plasty” means to repair. Angioplasty is also used in other parts of the body, usually to treat peripheral artery disease. The word is composed of the combining forms of the Greek words ἀγγεῖον angeîon “vessel” or “cavity” (of the human body) and πλάσσω plássō “form” or “mould”. The heart is an amazing muscle. It beats an average 100,000 times daily to pump almost 2,000 gallons of blood. To do this amount of work, the heart muscle needs a constant flow of oxygen and nutrients from the bloodstream. This is supplied by the coronary arteries, which supply the heart with the energy it needs to function. When people feel chest pain from blocked arteries, they might see an interventional cardiologist for treatment. This specialist might perform a balloon angioplasty to open the blocked artery. He or she may also place a device, called a stent, in their artery. 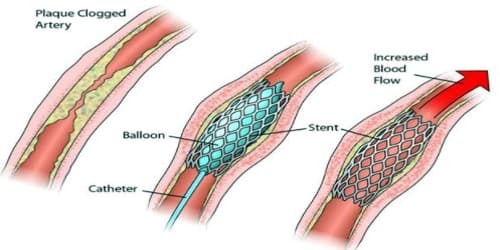 The stent is a metal mesh tube that, when expanded, is about the size of a spring in a ballpoint pen. The stent will help keep their artery open with less chance of it becoming blocked again, than if they had a balloon angioplasty alone. This procedure helps to restore normal blood flow to their heart. Before the operation: The patient’s may have to go for some preliminary blood tests. The doctor may tell them to not smoke for a period of time before or after angioplasty. For best results, the patient should quit smoking permanently. The patient shouldn’t eat after midnight on the night before their angioplasty. Ask the doctor if the patient can drink clear liquids after midnight. The patient can usually continue to take their medications, but they should confirm this with the doctor. The Procedure: Angioplasty requires an access vessel, typically the femoral or radial artery or femoral vein, to permit access to the vascular system for the wires and catheters used. If no access vessel of sufficient size and quality is available, angioplasty is contraindicated. A small vessel diameter, the presence of posterior calcification, occlusion, hematoma, or a bypass origin may all make access to the vascular system too difficult. Angioplasty is performed while the patient is awake, under local anesthetic. It’s sometimes uncomfortable, but not usually painful. The surgeon makes a small incision in the groin or arm and inserts a thin tube, called a catheter, into the artery. The catheter includes a small balloon and a small wire tube, called a stent. A dye that is visible under x-ray has been injected into the left coronary vessel and shows a blockage in the left main coronary artery and left anterior descending coronary artery. Normally a left main blockage will require that a patient undergo coronary artery bypass graft (CABG) surgery. 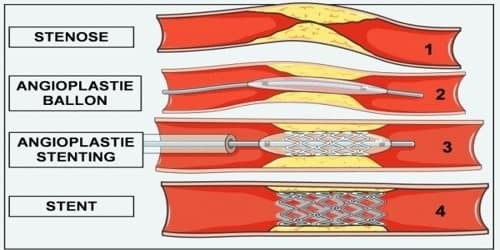 If a blockage is located, the cardiologist will insert a soft wire, carrying a balloon and a stent, into the catheter and pass them to the blockage. Once the balloon has reached the narrowed section of the patient’s coronary artery, the cardiologist will inflate the balloon at high pressure. This pressure will crush the blockage against the walls of the patient’s artery, much like pushing logs to the banks of a river. Once the narrowed area is pushed open, the doctor places the stent within the newly cleared area. The stent is expanded tightly against the patient’s artery wall to hold the artery open. The Patient’s may feel chest discomfort or pain for a few seconds when the balloon is inflated. The entire procedure usually takes 45 minutes to an hour. People will stay in the hospital for several hours or overnight. They will be asked to lie still while the blood vessel where the catheter was inserted begins to heal. During that time they will be checked for changes in their heart rate and blood pressure, and for any bleeding. People will be able to return to work about a week after leaving the hospital. They will need to make a follow-up appointment with their doctor. kidney problems, especially in people with underlying kidney disease and diabetes – this is caused by the iodine contrast dye used for the X-ray; intravenous fluids and medications can be given before and after the procedure to try to reduce this risk. Angioplasty may also provide a less durable treatment for atherosclerosis and be more prone to restenosis relative to vascular bypass or coronary artery bypass grafting. Some modern stents are coated with medication that reduces the likelihood of the patient’s coronary artery from becoming blocked again. The doctor will instruct the patient’s to take aspirin and one of several anti-clotting medications, such as clopidogrel, prasugrel, or ticagrelor, to prevent clotting. They should take these medications for 6 to12 months. After the angioplasty, the artery may become blocked again. Patients who experience swelling, bleeding or pain at the insertion site, develop fever, feel faint or weak, notice a change in temperature or color in the arm or leg that was used or have shortness of breath or chest pain should immediately seek medical advice. Lifestyle changes can extend the benefits of angioplasty and improve the patient’s health in general. These changes include weight loss, eating a healthy diet with no more than 30% calories from fat, eating less saturated fat, avoiding fried foods, adding a balanced exercise program, practicing stress reduction, and quitting smoking. If they have diabetes, they should maintain a healthy blood sugar level through proper diet, exercise, and medication. If the patient has high blood pressure (also called hypertension) or high cholesterol, they should maintain a normal blood pressure or cholesterol level through proper diet, exercise, and medication. What is Meant by Double Account System?